Old copies of Delineator magazine always have surprises that catch my eye. 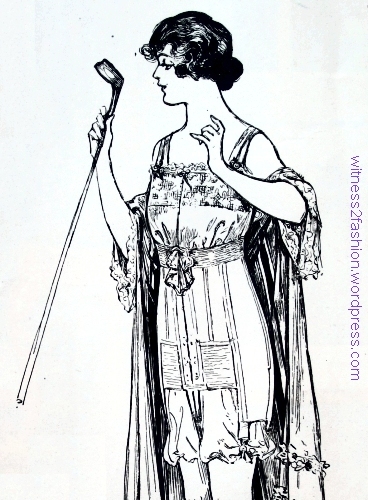 December fashions, Delineator magazine, 1918, top of p. 64. Butterick patterns 1276, 1260, 1255, and 1243. Parts of the December 1918 issue were probably ready to print before the Armistice was announced on November 11, and the magazine contains many references to World War I.
Butterick doll clothing: “boy doll’s military suit,” pattern 402, and “boy doll’s sailor suit,” 403. Delineator, December 1918. This woman’s “one-piece dress” pattern was available up to size 44. Butterick patterns for women, 1283, 1294, and 1305. December 1918. Two are fringed, and the gold dress is trimmed with black monkey fur. Delineator, p. 64. Pattern descriptions for Butterick 1283, 1294 and 1305, December 1918. Delineator. The blue dress (1278) is trimmed with fringe; the other outfit (blouse 1259 and skirt 1105) is trimmed with fur and decorative buttons. Delineator, Dec. 1918, p 63. Two different muff patterns were illustrated, 1190 and 9517. In addition to keeping your hands warm, a muff often had an interior pocket that functioned as a purse. Two more fringed day dresses, Dec. 1918. Delineator, p 63. Butterick 1253 and waist/blouse 1263 with skirt 9865. No. 1253 is illustrated in satin; waist 1263 is in velvet, worn over a satin skirt. Butterick patterns illustrated in Delineator. Dec. 1918, page 65. Fringe trims the center two. Fur or fringe trims these Butterick patterns in Delineator, page 71, December 1918. Women’s dresses No. 1294, 1309, and 1285. Butterick patterns, Delineator, Dec. 1918, p. 68. The shape of the skirt is determined by the high-waisted, curve-flattening corset of the era. 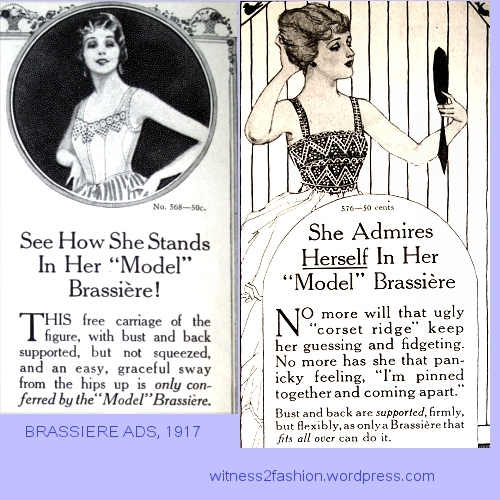 Fringe hangs from the pockets of a skirt, Delineator, Dec. 1918, p. 68. Butterick blouse 1306 with skirt 1226. Shirt-waist pattern 1279 with skirt of suit 1101. If you weren’t ready to go wild with fringe, you could carry a subtle fringed handbag instead of a muff. Winter coats from Butterick December 1918. The woman in the center carries a striped muff (Butterick 1266) to match her coat; the woman on the right carries a fringed handbag (Butterick pattern 10720.) Delineator, December 1918, p. 66. The coat on the right is a reminder that the “Barrel skirt” or “tonneau” was [to me, inexplicably] in fashion for a while. This is another set of dress patterns which were also sold as bridal patterns, this time from April of 1925. Illustration for the article “The New in New York: The Bride Takes the White Veil and Gown of Tradition, or Turns to Silver or Palest Pink” by Evelyn Dodge. Delineator, April 1925, p. 24. 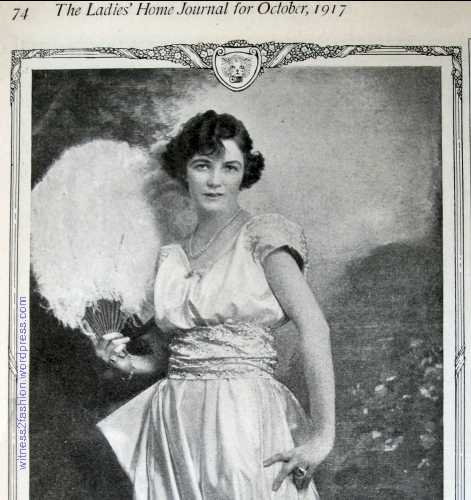 Maid (or Matron) of Honor and Bridesmaids, Delineator, April 1925, page 24. They are wearing Butterick patterns. 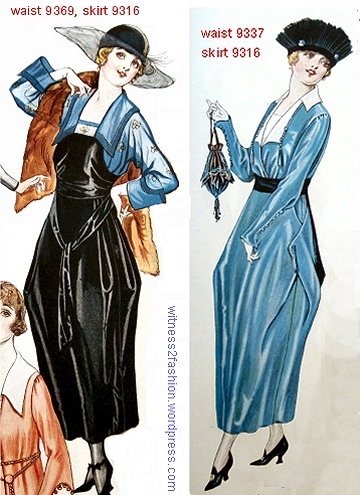 On left, and in detail, Butterick 5933, April 1925, Delineator. Butterick 5933 illustrated in May 1925, Delineator, page 26. 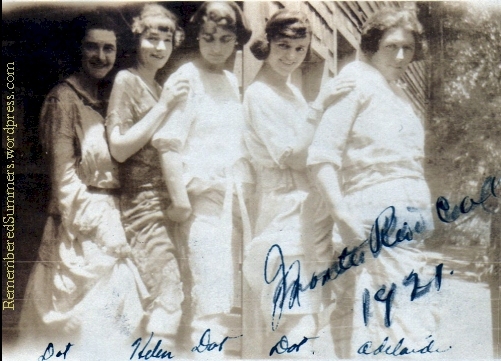 Two versions of the bridesmaids’ dress appeared, one for Ladies and one — with a different pattern number — for Misses 16 to 20. Left, Butterick pattern 5906, available in Ladies’ sizes, and right, Butterick 5919, for Misses 16 to 20 or small women. March and April, 1925, Delineator. There is a difference in hem length and torso length, and both differ slightly from the center illustration. Description of Butterick 5906, a lace dinner dress; March 1925. In addition to the article on page 24, there was an entire page of ideas for Butterick bridal patterns — most of which were also illustrated as day or evening dresses elsewhere in the magazine … sometimes months previously. “The Easter Bride Takes the White Veil and Gown of Tradition or Turns to Silver or Faint Pink.” Butterick bridal patterns, April 1925; Delineator, p. 33. I love finding more than one illustration of the same pattern — and Butterick often featured its patterns in Delineator magazine in two successive months — or in two places in the same issue. Butterick 5935, April 1925, left, page 33 and right, page 29. Delineator. 5786 in April 1925, p. 33, and in February 1925, p. 23. Delineator. Note the bust darts…. Butterick 5941, April, 1925; as a wedding dress and in a dark satin version. Delineator. Below the waist, a very asymmetrical design. Butterick 5963, April 1925, as a wedding dress, page 33, and in black satin with coral beading, page 31. Butterick 5755, 5714, 5713, Delineator, January 1925, page 29. 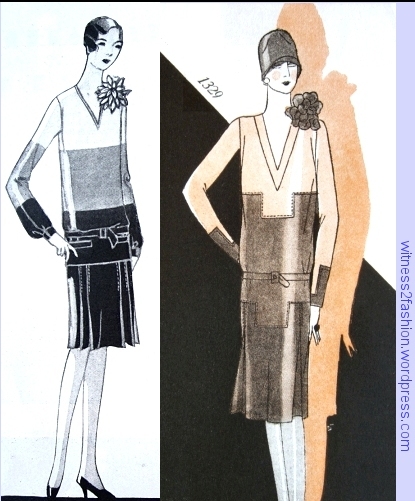 Butterick 5755, in April and in January, 1925. Delineator. 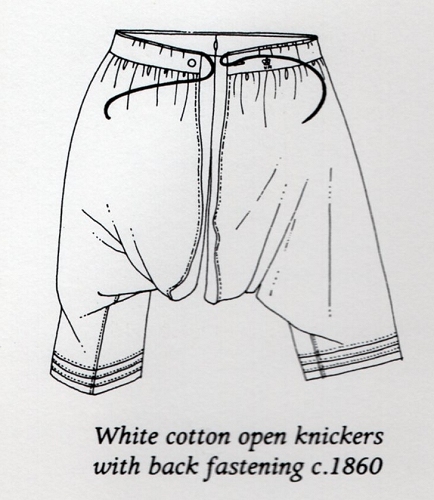 Note the ribbon at the natural waist. One of these was shown as a bridesmaid’s dress, and another as a wedding gown. Butterick patterns for Misses and small women, April 1925, pg. 36. Numbers 5919, 5960, and 5897. No. 5919, far right, was the bridesmaid, as discussed above; No. 5960 (center) has sleeves and beading in its bridal version. Butterick 5960 for a wedding, page 33, and for a party, page 36. April 1925, Delineator. Butterick 5719 and 5447. Originally issued a few months earlier than April 1925, as can be seen from the number sequence. Is that a Spanish comb on the right? Butterick 5447 was the bridal gown for October 1924, p. 27. Delineator. The tabard of No. 5719 would lend itself to a silvery, medieval look, especially with a long-sleeved underdress. Butterick 5719 in April 1925 and in Dec 1924. Delineator. Wedding dress, English, 1924. The tabard is worn over a pleated dress. A silver wedding dress, with heavy lace trim, was also in the Bethnal Green Exhibit. Silver wedding dress, English (Ada Wolf); 1924. Bethnal Green Museum postcard. Advice for brides, April 1924, by Evelyn Dodge writing in Delineator.